The road to Bolivia took us up and over the Andes at more than 4,000 metres. A stretch of 30 kilometres of the road was mud and slush with temperatures dropping to around 4 degrees. The altitude was testing for man and machine. While the road was hard the scenery was beautiful – the magnificent lake that is the centre piece of Parque National Lauca and vicuna, the South American camel with the finest wool. 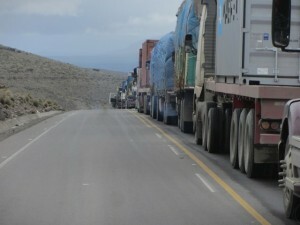 Trucks lined the road to the border post – a line stretching as far as the eye could see. Street hawkers were selling meals and drinks to the drivers waiting to cross in to Bolivia. Leaving Chile was no problem and the Bolivian police/immigration side of things was easy. 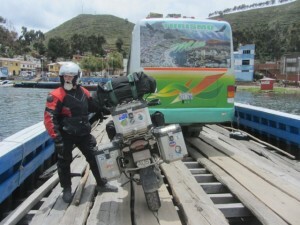 To get the bike into Bolivia we needed a form filled in and lodged by computer, a service we had to pay for. The customs official took us to the money changers – a group of women wearing the traditional dress of brightly coloured clothes and bowler hats. They exchanged our remaining Chile pesos for Bolivianos. The next stop was to get the form for the bike typed in to a computer for the cost of 10 Bolivianos. Brian wrote out the form. The young lady keyed it in to the computer and we returned to the official. He printed up the form and bingo – we were in Bolivia. La Paz is a crazy city stretching from the high area at 4,000 metres, the downtown at 3,500 metres and the wealthy area at 3,000 metres. We’ve been warned to keep our valuables close and watch out for bag slashers, bag snatchers and fake police. As we go to walk out of the hotel the receptionist rushed up to us to make sure we’ve read the safety notice inside the front door! This level of paranoia doesn’t help us enjoy La Paz. On the outskirts of town is the Luna Valley. 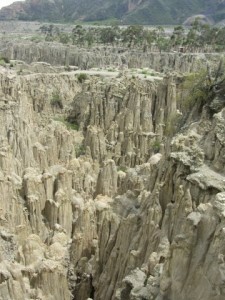 This clay landscape resembles the Goreme Valley in Turkey and is an expanse of pillars, valleys and formations. 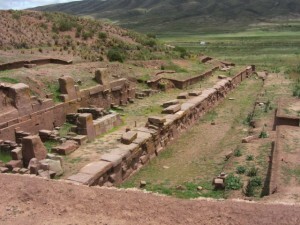 It is the history of South America that intrigues us so our visit to Tiwanaku, 75 ks from town, is fascinating. This is where civilisations from 600 BC to 1200 AD lived, worked and worshiped. It is their temples that have stood the test of time. Mummies were laid to rest. The high priests used the sun streaming in to the temples to tell the farmers when to plant their crops and when to harvest. These were amazing people who were driven away when Lake Titicaca’s banks moved, firstly flooding their town and then receding to its present location some 70 kilometres away. We moved on to Copacabana, on the banks of Lake Titicaca. The GPS and all electronic maps took us via Peru. We headed out on the shortest route and realised why the maps took us the long way round when we arrived at the ‘ferry’. The crossing was slow with us and the bus being led along by a small outboard motor attached to the barge. I suppose the barge wasn’t that heavy when you consider the number of planks missing! Copacabana is a small relaxed town that services the tourists who flock to visit Isla del Sol. The island of the sun and its smaller cousin, Isla de Luna. The moon island was principally a retreat for young virgins who were tutored in secret women’s business to prepare them for family life. 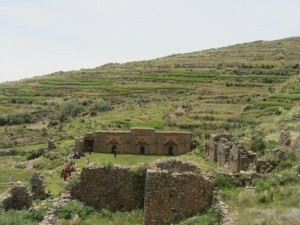 Isla de Sol, the sun island, is terraced extensively for farming – by hand. The residents today still farm by hand. There are no mechanical beasts of any description on this island. 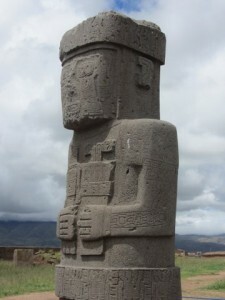 The Incan temples revering the sun and moon remain to this day. 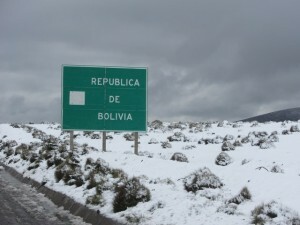 All too soon we must leave Bolivia and cross the small border outpost into Peru. We’ve been keeping track of you since we left South America. We thought of you last weekend while watching the Australian GP from Melbourne. We’re still getting snow in the mountains near us in Oregon but Spring is starting to happen. It looks like you’re having a great time – we’re jealous. Enjoying the trip nearly as much as you both ! Catching the occasional radio broadcast as well. Keep having fun & keep upright! Did you go to San Pedro prison in Bolivia. 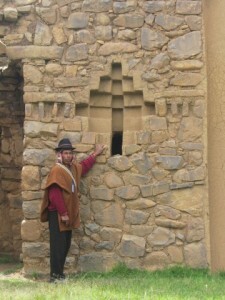 The gaol in Bolivia where you can have a guided tour by the inmates? Thank you for a pleasant evning in Copacabana We are now back in Copenhagen. 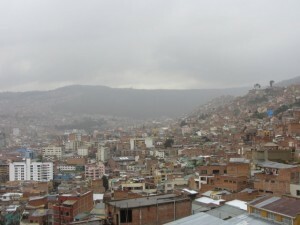 It is not so eksotic, but the houses are warmer than the hotels in Bolivia.